Truth is a 2015 American political docudrama film written and directed by James Vanderbilt in his directorial debut. It is based on American journalist and television news producer Mary Mapes' memoir Truth and Duty: The Press, the President and the Privilege of Power. The film focuses on the Killian documents controversy, and the resulting last days of news anchor Dan Rather and producer Mary Mapes at CBS News. It stars Cate Blanchett as Mapes and Robert Redford as Rather. Truth had its world premiere at the 2015 Toronto International Film Festival. The film received a limited release in the United States on October 16, 2015, before being released nationwide on October 30, 2015, by Sony Pictures Classics. In the months before the US 2004 presidential election, Mary Mapes (producer of the primetime news program 60 Minutes Wednesday) and her crew consisting of Mike Smith (Grace), Lucy Scott (Moss), and Colonel Roger Charles (Quaid) are seeking evidence to verify whether or not George W. Bush received any preferential treatment during his time in the military. Charles, knowing that the military "is good at what they do," believes there were no mistakes or errors, despite some claims that Bush's records were lost or altered, and that Bush had difficulty meeting minimal physical aptitude testing. Seeking leads, Mapes and her crew eventually find Bill Burkett, who says he has hard evidence in the form of memos and letters dictating that Bush did indeed have preferential treatment. Mapes produces a story that Dan Rather reports on 60 Minutes. After the airing, Mapes and Rather face questions over the accuracy of the segment. The core documents on which these allegations were based were immediately called into question by a variety of sources, with some indicating the documents as being forgeries, which was then investigated and amplified by various talk radio hosts, bloggers and numerous mainstream media sources, including The Washington Post and CBS itself. They easily found that certain characteristics of the memos, such as its font and letter spacing, indicated the memos were created on a computer using Microsoft Word, and therefore could not have been typed on a typewriter in the early 1970s. Subsequently, Burkett, who produced the documents, admitted that he had lied about where he had obtained them. After the scandal, Mapes, her crew, and Rather are faced with charges that Mapes' liberal political agenda played a part in airing the segment. One by one they are forced to face an internal review panel to determine whether or not political bias was a factor in the report. Smith, Scott, and Charles are eventually banned from their work and subsequently fired, with Smith going on a rant in the office before being escorted out. Rather faces the music, and decides that after the hearing he will retire from broadcasting. While Mapes faces the board, she comes under heavy fire about her agenda in connection with the segment. Mapes stands up for herself and presents the evidence from her point of view. After the hearing, Mapes is fired and Rather makes his last broadcast, citing how courage helped his and his crew get through the toughest of times. The film is based on Mary Mapes' 2005 memoir Truth and Duty: The Press, the President, and the Privilege of Power. It was produced by Mythology Entertainment. The film had been in development since 2007. In July 2014, it was announced that Robert Redford and Cate Blanchett would portray CBS News anchor Dan Rather and 60 Minutes Wednesday producer Mary Mapes, respectively. In September 2014, Elisabeth Moss joined the cast as CBS associate producer Lucy Scott, and Dennis Quaid was cast as Colonel Roger Charles. Topher Grace and John Benjamin Hickey joined the film in October, as researcher Mike Smith, and Mark Wrolstad, Mapes' husband, respectively. Bruce Greenwood was cast as Andrew Heyward, president of CBS News. In November, David Lyons was added to the cast as Josh Howard, 60 Minutes executive producer and Mapes' supervisor. It was later reported that Stacy Keach had joined the cast of the film. Mandy Walker is the cinematographer, and Fiona Crombie is production designer. Brian Tyler scored the film. The film's production budget was more than $9.6 million. Principal photography began in October 2014 in Sydney, with filming scheduled for eight weeks during the Australian spring. On May 18, 2015, it was announced that Sony Pictures Classics had acquired United States distribution rights for $6 million. The film was selected to be screened in the Special Presentations section of the 2015 Toronto International Film Festival in September 2015, and was selected as the Opening Night film of the 23rd Hamptons International Film Festival. It premiered in the UK at the BFI London Film Festival. The film was released in the United States on October 16, 2015, with a limited opening in 6 theaters, making $66,232. It expanded wider on October 30 to 1,122 theaters, making $875,935, for a total of $1.1 million. Variety described this a "dispiriting" opening. The Hollywood Reporter said that the film had disappointing opening numbers, as, like other adult dramas and awards hopefuls released in October, it suffered from a "total market saturation by films aimed at the over-30 crowd". As of January 15, 2016, the film's domestic total is $2.54 million. The film was described as a "bomb" at the box office, after failing to garner expected revenue. Truth was well received at the Toronto International Film Festival, where The Hollywood Reporter named it the best film at the festival. On the review aggregator website Rotten Tomatoes, Truth has a 62% approval rating based on reviews from 170 critics, with an average rating of 6.2 out of 10. The website's critical consensus states: "Truth's terrific cast and compelling message are often enough to overcome its occasionally didactic and facile dramatization of a nuanced real-life tale." On Metacritic, the film has received a weighted average score of 66 out of 100 based on 35 critics, indicating "generally favorable reviews". Brian Tallerico of RogerEbert.com praised Blanchett and Redford's performances, but said the characters act as mouthpieces for Vanderbilt's political views. Dan Rather praised Truth noting that, "there's so much right in the film ... I think it's the best thing that's ever been up on the big screen about how television news really works, the reporting side of it: the telephone calls, wearing out the shoe leather going to see people, developing sources." He also commended Redford's portrayal of him as Redford "did not, which I appreciated very much, try to imitate. He tried to get some essence of me as a person and as a professional." In September 2015, a source close to the film said CBS president and CEO Leslie Moonves did not approve of the film, but did not ask producers for major changes. A source at CBS said it was not planning on publicly condemning the film. In October, Gil Schwartz, the chief spokesman for CBS, who is depicted in the film, said "It's astounding how little truth there is in Truth. There are, in fact, too many distortions, evasions and baseless conspiracy theories to enumerate them all. The film tries to turn gross errors of journalism and judgment into acts of heroism and martyrdom." Andrew Heyward, president of CBS News at the time of the incidents and depicted in the film, said he had not seen the film, but knew its story and was outraged at its portrayals, adding that "only Hollywood could come up with that." CBS refused to advertise the film because of the movie's "inaccuracies and distortions" which would offend CBS News employees. Some at CBS News are "angered" with the film's implication that news executives were pressured to revoke the story by corporate owner Viacom, which "had business reasons to maintain friendly relations with the Bush administration." In a statement, the film's producers stated, "Although we understand CBS wants to put this episode behind them, it's disappointing that they seem to be so concerned about our film … The events depicted in Truth are still vigorously debated, and that's a good thing". Brad Fischer, one of the producers, said that a negative response from CBS was not unexpected, but what was surprising is the "tone and the emotional nature" of the response. He said that the filmmakers were "attracted by the intersection of news, politics and business and the story's status as one of the first to be undone by an Internet outcry" and that he hopes people "talk about the issues and ask the questions themselves...I don't think it's our job as filmmakers to draw a conclusion, but rather to pose the questions." ^ "Truth (15)". British Board of Film Classification. November 10, 2015. Retrieved November 10, 2015. ^ a b "Robert Redford, Cate Blanchett Ready For 'Truth' Sydney Shoot". The Hollywood Reporter. October 22, 2014. Retrieved November 24, 2015. ^ a b "Truth (2015)". The Numbers. Nash Information Services, LLC. Retrieved March 1, 2017. ^ a b "'Truth', 'Room', 'The Assassin' & A Netflix Title Vie For Specialty Crowds – Preview". Deadline Hollywood. October 16, 2015. Retrieved October 16, 2015. ^ a b Truth movie review, RogerEbert.com, October 16, 2015. ^ "'Rathergate' Drives 'Truth' Film; Robert Redford To Play Dan Rather, Cate Blanchett To Play Producer Mary Mapes". Deadline Hollywood. July 9, 2014. Retrieved April 14, 2015. ^ "SPC throws 'Truth' into awards ring". Screen International. July 31, 2015. Retrieved August 1, 2015. ^ Cusumano, Katherine (October 2015). "Giorgio Armani and The Cinema Society host a screening of Sony Pictures Classics' Truth". Interview. Retrieved October 15, 2015. ^ "Robert Redford to Play Dan Rather in CBS Scandal Movie 'Truth'". Variety. July 9, 2014. Retrieved April 14, 2015. ^ "Elisabeth Moss joins Robert Redford and Cate Blanchett for Dan Rather scandal drama 'Truth'". HitFix. September 23, 2014. Retrieved April 14, 2015. ^ "Dennis Quaid Joins Dan Rather-George W. Bush Scandal Pic 'Truth'". Deadline Hollywood. September 30, 2014. Retrieved April 14, 2015. ^ "Topher Grace Cast In 'Truth', Dan Rather-George W. Bush Scandal Pic". Deadline Hollywood. October 2, 2014. Retrieved April 14, 2015. ^ "'Manhattan' Star John Benjamin Hickey Joins Dan Rather Scandal Movie". The Hollywood Reporter. October 2, 2014. Retrieved April 14, 2015. ^ "Bruce Greenwood Joins Dan Rather Scandal Movie". The Hollywood Reporter. October 27, 2014. Retrieved April 14, 2015. ^ "'Revolution' Alum David Lyons to Play '60 Minutes' EP in Dan Rather Movie 'Truth'". TheWrap. November 13, 2014. Retrieved April 14, 2015. ^ Todd McCarthy, "'Truth': TIFF Review", The Hollywood Reporter, September 12, 2015. ^ "Walker on Truth, Westerns and ACS Gold Winner Tracks". American Society of Cinematographers. November 12, 2014. Retrieved April 14, 2014. ^ "Truth in Sydney". HLA Management Australia. October 28, 2014. Retrieved April 14, 2015. ^ "Composer Brian Tyler to keynote 2nd Annual Production Music Conference". Shoot. July 31, 2015. Retrieved August 2, 2015. ^ "Truth Filming in Sydney". Ausfilm. October 24, 2014. Retrieved October 18, 2015. ^ "Robert Redford, Cate Blanchett Ready For 'Truth' Sydney Shoot". The Hollywood Reporter. October 22, 2014. Retrieved April 14, 2015. 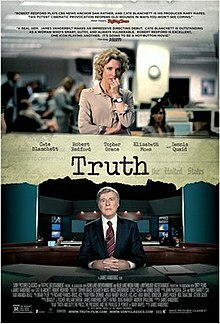 ^ "Sony Pictures Classics Finds 'Truth'; Robert Redford-Cate Blanchett Starrer Goes For $6 Million – Cannes". Deadline Hollywood. May 18, 2015. Retrieved May 18, 2015. ^ "Sandra Bullock's 'Our Brand Is Crisis,' Robert Redford's 'Truth' to Premiere at Toronto". Variety. August 18, 2015. Retrieved August 18, 2015. ^ Raftery, Brian (September 12, 2015). "TIFF 2015: Robert Redford, Cate Blanchett Tackle Rathergate in 'Truth'". Yahoo! Movies. Retrieved September 14, 2015. ^ "Robert Redford-Cate Blanchett Drama 'Truth' to Open Hamptons Film Festival". The Hollywood Reporter. August 26, 2015. Retrieved September 4, 2015. ^ "Greek comedy wins top prize at BFI's London Film Festival Awards". The Guardian. October 17, 2015. Retrieved October 21, 2015. ^ Kit, Borys (July 31, 2015). "Dan Rather Scandal Movie Gets Release Date". The Hollywood Reporter. Retrieved August 1, 2015. ^ "Box Office: 'Our Brand is Crisis,' 'Burnt,' 'Scouts Guide' All Bomb". Variety. November 1, 2015. Retrieved November 18, 2015. ^ "Box Office October Scare: Why So Many Movies Bombed". The Hollywood Reporter. November 1, 2015. Retrieved November 18, 2015. ^ Truth at Box Office Mojo. Retrieved July 6, 2016. ^ Pamela McClintock. "Box Office October Scare: Why So Many Movies Bombed". The Hollywood Reporter. ^ Sperling, Nicole (November 6, 2015). "Shocktober: What happened to Bradley Cooper and Sandra Bullock at the box office?". Entertainment Weekly. ^ McClintock, Pamela (November 3, 2015). "Bombed at the box office - CNN.com". CNN. ^ Hammond, Pete (December 3, 2015). "Cate Blanchett on Her Embarrassment of Riches With 'Carol' & 'Truth'". Deadline Hollywood. Penske Business Media. Retrieved January 18, 2016. ^ "TIFF: THR Critics Rank 15 Films From Best to Worst". The Hollywood Reporter. Prometheus Global Media. September 16, 2015. Retrieved January 18, 2016. ^ "Truth (2015)". Rotten Tomatoes. Fandango. Retrieved April 9, 2018. ^ "Truth Reviews". Metacritic. CBS Interactive. Retrieved June 26, 2016. ^ Ordona, Michael (December 29, 2015). "Dan Rather is sticking to the 'Truth' of his story about George W. Bush". Los Angeles Times. Retrieved March 20, 2016. ^ "Leslie Moonves and CBS Staff Heard Dismissing Robert Redford's Dan Rather Movie as "Half-Truth"". The Hollywood Reporter. September 16, 2015. Retrieved October 17, 2015. ^ a b "Dan Rather vs. George W. Bush: 'Truth' comes out". Fortune. October 16, 2015. Retrieved October 17, 2015. ^ "In 'Truth,' a News Team Tells Its Side of a '60 Minutes II' Scandal". The New York Times. October 14, 2015. Retrieved October 21, 2015. ^ a b "CBS Bans Ads for Dan Rather Movie 'Truth'". The Hollywood Reporter. October 16, 2015. Retrieved October 16, 2015. This page was last edited on 27 March 2019, at 21:33 (UTC).